The Corvus 400 changed during production time it's calculator brain. This one uses a MK50282A single-chip calculator circuit and two digit driver circuits instead the MK50280A. Learn more about Mostek Calculator Integrated Circuits. With the JCPenney 2310 a colorful sibling of this Corvus 400 was introduced. Within some month the four unusual N-batteries were replaced with a standard 9V battery. Don't miss the Corvus 406. 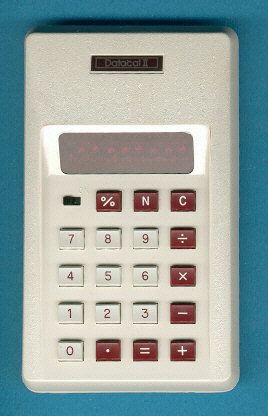 Note: The pictured calculator is a Datacal II market by V.I.P. Programs Co.